BMW E36 Cooling System Kit (M44 / 1.9L). Premium Cooling System Kit for BMW. 318i - 318is - 318ti - Z3 with 1.9L / M44 Engine. Complete cooling service kit with Eurpean OEM components from Graf, Vernet and Continental. Complete Kit Includes The Following New Parts. Graf / All New / Metal Impeller. Vernet / OE Temperature / With Gasket. ContiTECH / Alternator - Water Pump - Power Steering Pump. Picture shows actual parts for reference. For any questions regarding this item... We answer all messages within 24 hours. Really Good Parts, Prices And Service! The item "BMW E36/M44 Cooling Kit Water Pump, Thermostat, Radiator Hoses, Belts, Gaskets" is in sale since Monday, November 07, 2011. 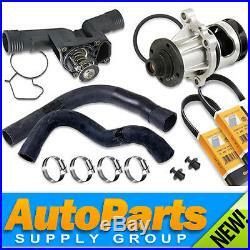 This item is in the category "eBay Motors\Parts & Accessories\Car & Truck Parts\Cooling Systems\Thermostats & Parts".